If you ever stared blankly at a 20-deep upgrade list before a Delta Air Lines flight, you are not alone. That groan you hear coming from a middle Comfort+ seat is probably from a Silver Medallion who never scores a complimentary upgrade to first class. Comments from the TPG Lounge on Facebook paint a sad picture: Many Silvers have given up on the illustrious upgrade. Don’t quit. There is hope. When I quickly achieved Silver status in March I was already jaded from my friends sending me photos from coach as Gold Medallion members. It was my first time as an elite on any airline. I thought the best possible perk was the ability to pick exit row seats, such as the dreamy 27A on the A321 with no seat in front. Jaded or not, I obsessively check the Delta app a few days out from my June 5 Orlando (MCO) to New York – LaGuardia (LGA) flight. About 36 hours prior to departure after Gold Medallion upgrades cleared, I saw three seats left for the 8:10 a.m. flight. Counting down to my check-in time, I had a chance. I was shocked when I saw the upgrade to first class with 11 hours to spare — and no nervous waiting at the gate. It was a miracle but it wasn’t just dumb luck. I strategically gave myself the best possible shot when I booked my flight three weeks prior. And yes, I was upgraded on the return; on a Friday no less out of New York. That took maneuvering, as I will explain in detail. When and How Upgrades Occur? Fare class groupings. Note: “groupings” — not a straight list — which makes the rest in the hierarchy key. Basic Economy “E” is exempt from complimentary upgrades. Here are some tips for Silver elites. If you have more, please comment. First rule: Find a flight with the largest first class cabin with few or no assigned seats. For instance, some Boeing 717s only have 12 first class seats while the 757-200s fit 20. However, purchase outside the 14- or 21-day advance window to save costs. Caution: Since fares dramatically increase closer to departure date, there is little incentive to wait too long to pick optimal flights. Frankly, it’s probably cheaper to purchase a discounted first class ticket over a last-minute economy fare. Although, if flying for business and you have some flexibility, use this to your advantage but note you may lose No. 6 on the hierarchy list. The fare class matters: Since you are competing against other Silvers, your fare class is the most important advantage. However, do not overthink this. Many travelers will be in the same fare class group since most buy the cheapest ticket. Speculative buying doesn’t make sense for the lowly Silver. Spending $50-$100 more might be all in vain. Diamond and Platinum elites think about this more. Let analytics help you: Statistically speaking, flying on the optimal day of the week and time of day is your best chance to upgrade. Sundays, Mondays and Fridays represent a higher chance for a full cabin and that means more competition. Tuesdays, Wednesdays and Saturdays often see less business travel thus fewer elites. If you want to sit upfront, think about a predawn flight. I was tempted to book a 6 a.m. flight, which was a sure bet in hindsight, but I would rather fly coach than wake up at 3 a.m. Any flight before 8:30 am and after 8:30 p.m. dramatically improves chances. How many Delta Comfort+ seats are reserved? Since Diamond and Platinum flyers can immediately book into those seats, this may predict your stiffest competition. However, since the public can purchase those seats, it’s impossible to accurately know. I was surprised how many non-elite flyers paid to reserve those seats. However, if you are choosing between two flights, go with the one that shows the most available Comfort+. In any case, you may get an upgraded C+ seat. This Tuesday, 7 a.m. flight from Denver to New York City-JFK is two weeks from departure. Note 14 seats are available in first class. Worst case, Diamond or Platinum elites reserved those two Comfort+ seats. There is a higher probability you could snag a first class upgrade as a Silver. Note on the same day at 11:50 am, there are 13 first class seats available but the Comfort+ cabin is mostly full. That is a indication there may be strong competition on this flight as Diamond and Platinum elites can immediately book into Comfort+. Is it a common leisure or business route? Competing against families, which might fly less often, instead of frequent business travelers could give you a better chance of a first-class upgrade. How committed are you? Would you pay $75 to instantly upgrade? It takes a phone call to the Medallion phone line but it’s better than waiting for an upgrade at the gate or flying coach. Delta offers same-day confirmed changes for Silver Medallion members and the public for $75. (It’s free for other elites.) However, there are major caveats. First, no airport changes allowed. Second, you can only re-book in the same fare class as your original flight. That doesn’t mean at the same fare cost. For instance, if you purchased a V class fare, there must be V seats remaining. Third, call within 24 hours prior to departure. At check-in time for my 2:29 p.m. LGA-MCO flight, there was one remaining first class seat and I was already No. 2 on the upgrade list. I peeked at the availability of the noon flight and I saw five open first class seats. On a hunch, I called Delta and asked, “Is there RU space available?”, using the term for upgraded tickets. The agent confirmed there was and the same fare class was available, so I paid the fee and was instantly upgraded. For me, landing two hours earlier with a lunch flight to boot (the route is over 999 miles, meaning I’d get a meal in first) was an easy call. Plus, as a cardholder of the Premier Rewards Gold Card from American Express, which includes a $100 annual airline fee credit, I was reimbursed $75. The Platinum Card® from American Express offers up to $200 in airline fee credits. 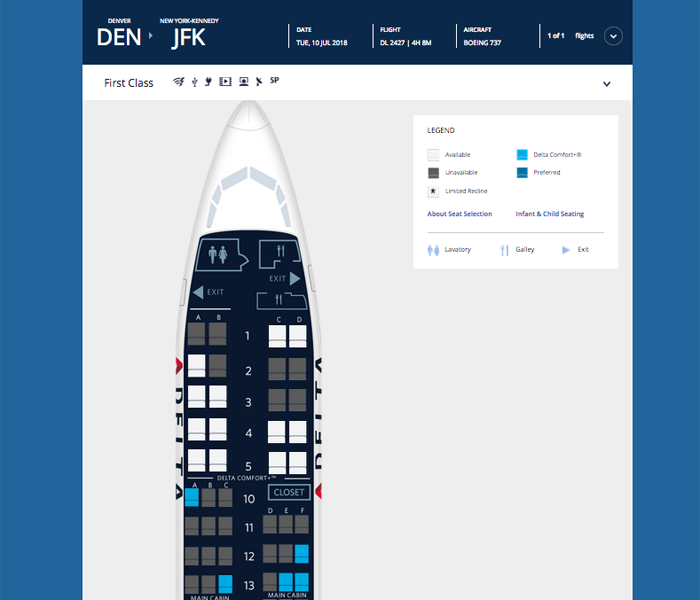 Important: When you call Delta, don’t ask for “upgrade space.” That can mean multiple options. Cut to the chase and ask for “RU space” and include a flight number. Change to a flight that is already within the check-in window so there is no waiting and you won’t pay the fee in vain.